When you’re suffering from lower back pain, no matter the source, the first thing on your mind is probably quick and easy pain relief. Unfortunately, not all pain relief treatments are quick and easy, and sometimes pain relief shouldn’t be your main priority. At Caron Chiropractic Clinic, we make sure that our patients receive the treatment they need to live healthier, pain-free lives, which means that we treat not just pain and symptoms, we treat injuries and conditions at their source to ensure that we eliminate not just your pain but the cause of your pain as well. Our North Oaks chiropractic office offers several lower back pain treatment options, suited to your individual treatment needs, including spinal adjustments, ArthroStim adjustments, and spinal rehabilitation. For comprehensive pain relief and injury treatment, depend on our chiropractic care and natural doctors to set you on a path of lower back pain relief. When your back is misaligned, it can create several issues with the way your body moves and functions. When you think about how much of your body’s movement is dependent upon a healthy and functional spine, it’s no wonder that misaligned vertebrae can be the source of pain throughout several parts of your body, including your lower back. If your lower back pain is being caused by a misaligned spine, we can provide a simply fix for the problem that doesn’t involve an invasive surgery. With spinal adjustments, we can realign your vertebrae, relieving lower back pain and ensuring your misaligned back doesn’t create pain or problems anywhere else in your body. For some patients, one small adjustment will often do the trick to provide lasting pain relief, but for others, a more long-term treatment plan may be needed, which could include several spinal adjustments to ensure that your lower back heals completely. The ArthroStim is a chiropractic instrument used to administer targeted adjustments that affects small portions of your back at a time, offering an alternative, or sometimes a useful supplement, to spinal adjustments. If we can pinpoint the source of your lower back pain to one or two small areas that need adjusting, it can be beneficial for you and your back to have a more focused adjustment rather than a full back realignment that requires twisting, turning, and cracking of your joints. While spinal adjustments are exceptionally helpful in treating many patients with lower back pain, not all patients need a full adjustment. In addition, the ArthroStim allows us to adjust patients in any position, which means that we can provide immediate pain relief, and you can see just how exact this treatment is. Whether you have lower back pain when you’re sitting, standing, lying flat, or in any other position, we’ll be able to make adjustments with the ArthroStim while you’re in any position so that you know immediately whether we’ve effectively treated the source of your pain. Encompassing any chiropractic care treatments that could be used to provide lower back pain relief, spinal rehabilitation can include full spinal adjustments and ArthroStim adjustments, massage therapy, exercise programs and routines, and changes to your lifestyle or habits that could be increasing your pain. Spinal rehabilitation is used as a form of physical therapy following spinal injuries or surgeries, which means that when you come to our office, we’ll already know the major cause of your lower back pain. When we know the cause of your pain, we’re already well on our way to knowing the best treatment plan to relieve your pain as well, and we can create an individualized lower back pain relief treatment plan that will work to rehabilitate your back as quickly as possible. If there are any underlying causes of lower back pain, we’ll identify those as well, looking at your exercise habits, posture, and strains on your body at work to ensure that we are targeting every source of back pain and preventing future injury. Not all injuries can be treated with a quick and easy spinal adjustment or one-time massage therapy appointment. For many patients suffering from lower back pain, long-term treatment plans are created to provide lasting pain relief and target the source of their pain over a period of time. When you come to our clinic, you’ll see that our natural doctors focus not only on pain relief but on treating injuries and conditions. With our treatments, we can work to permanently eliminate lower back pain, or for chronic conditions or injuries that cannot be cured, we’ll create individualized treatment plans to provide lasting lower back pain relief as frequently as is needed. 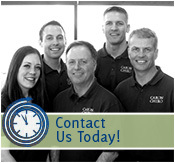 Come to the Caron Chiropractic Clinic, and find out what our North Oaks chiropractic care specialists can do for you. Call us at 651-255-9999, and say goodbye to lower back pain today.